Nick Land’s unfolding series The Shape of Time—well worth the read, like all of Land’s multi-part essays—quotes John Michael Greer at length in an attempt to summarize the various ‘time shapes’ with which the Occident has ordered time and understood its place in the unfolding expanse of it. Land, following Greer, identifies two major shapes: the Augistinian and the Joachim. The former is the Christian time shape, beginning with Creation and the Fall, ending with The Last Day and Paradise. Everything in between—that is, secular history—is merely the muddled middle through which God and Christ lead the elect. To Joachim, sacred history was not limited to a paradise before time, a paradise after it, and the thread of the righteous remnant and the redeeming doctrine linking the two. He saw sacred history unfolding all around him in the events of his own time. His vision divided all of history into three great ages, governed by the three persons of the Christian trinity: the Age of Law governed by the Father, which ran from the Fall to the crucifixion of Jesus; the Age of Love governed by the Son, which ran from the crucifixion to the year 1260; and the Age of Liberty governed by the Holy Spirit, which would run from 1260 to the end of the world. What made Joachim’s vision different from any of the visionary histories that came before it — and there were plenty of those in the Middle Ages — was that it was a story of progress. Yes, a story of progress, but almost certainly a story of moral progress. The progressive time-shape—an ordering of time which denies the existence of feedback loops, regression, cycles, a complexly but systematically enforced sustainability—has today developed conceptually along two disconnected axes: the moral and the technological. The first is exemplified by radical, millennial Protestantism and its belief in the perfectability of mankind. The ordering of time along an axis of ever-perfecting moral progress was the explicit assumption of John Noyes and other 19th century North American utopian Christians; it is the implicit assumption of the progressive Left in the 20th and 21st centuries. It is given its clearest form in Martin Luther King Jr.’s gnomic apothegm: “The arc of the moral universe is long, but it bends toward justice.” The axis of time stretches in one direction; its purpose is predominantly moral; and its terminal point is the moral perfection of human beings. The discourse of the progressive Left constantly reaffirms this sense of universal purpose. However, the ordering of time along an axis of ever-expanding technological progress has little to do with the time shape of moral progress. Ray Kurzweil is the obvious exemplar in this case. The first chapter of The Singularity is Near explicitly orders the history of time according to Six Epochs, each representing a more advanced stage of knowledge and/or technological progress than the epoch that came before it: Epoch One: Physics and Chemistry. Epoch Two: Biology and DNA. Epoch Three: Brains. Epoch Four: Technology. 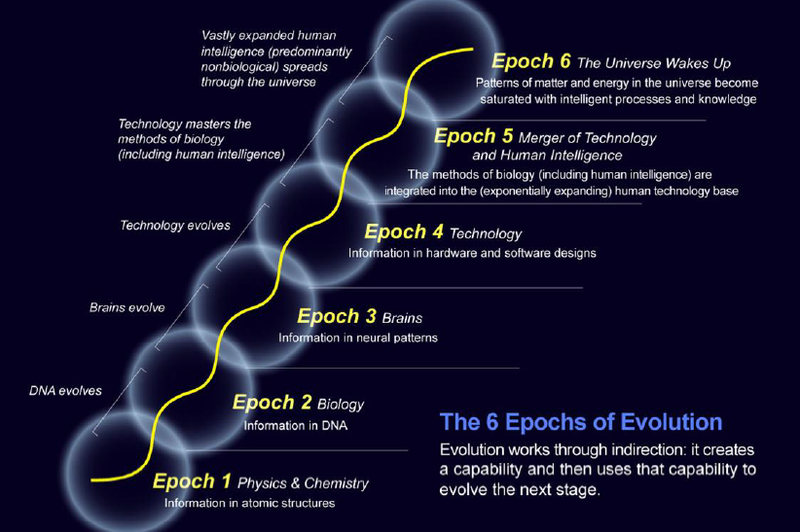 Epoch Five: The Merger of Human Technology with Human Intelligence. Epoch Six: The Universe Wakes Up. This time shape is given its clearst form in the idea that “humans are the minds through which the universe comes to know and marvel at itself.” Humans with the highest IQs and most advanced technology are obviously in the best position to further travel along this arc of technological progress toward singularity. Those who order time according to the shape of Moral Progress rarely have any affinity for those who order time according to the shape of Technological Progress. And vice versa. They see time expanding toward very different (though, I suppose, not mutually exclusive) goals. My personal preference is obviously for the latter time shape: technological progress. I am only concerned with moral progress insofar as vice leads to social disorder and instability, which are not optimal for the progress of knowledge and technology. I have, for most of my adult life, been a firm believer in technological progress; even in my nominally Leftist days, however, I was skeptical about the existence of moral progress. As a neoreactionary, I outright deny it. In general, good evidence exists for accepting the one time arc but denying the other. Moral progress is a blatant absurdity. Slavery is as rampant today as it was a thousand years ago; wars and rumors of war never cease. The idea that the species can be improved in some way, as Cormac McCarthy said, is a false idol, and those who worship it make their lives vacuous and corrupt. My rejection of progressivism is ultimately a rejection of the belief in moral progress; it also results from the belief that those who try to push the world along a time arc that doesn’t actually exist are usually the ones pushing it, at various times and places, into the social disorder and instability they seek to obviate. Conversely, technological progress is a blatant reality. Isn’t it? Science would look like magic to human populations from just a few hundred years ago. Diseases have been eradicated or made easily treateable. A thouand years back, humans hadn’t made it across the Atlantic Ocean; now we fly over it in a few hours; hell, making it to the moon isn’t too much trouble . . .
That is to say, making it to the moon wasn’t too much trouble at one point. Today, NASA can’t even put a person in low-earth orbit. Regression. To a Westerner in 2013, the notion of regression is frightening, nearly horrific. In most dystopian visions, things regress, but somewhere someone retains high-tech knowledge and skill. Earth in Elysium may be one giant Mexican city, but the whites, Indians, and Asians on Elysium itself have advanced closer toward Singularity. In Wells’ vision, the Eloi are docile illiterates, but the Morlock still know how to run the machines. A global regression, on the other hand, means that everyone has forgotten. Lost knowledge of the ancients. My modern bias tells me that the ancients didn’t know anything worth knowing in our age of science, but maybe that’s not true. Regardless, if contemporary knowledge is lost, then our distant idiot ancestors will have lost the knowledge of the ancients. If we take Greer’s and Land’s thesis seriously—that any time shape positing an Arc of Progress is seriously problematic—then we must prepare ourselves for the possibility that a technolgoical Elysium is as unattainable, or, at least, as unlikely a goal as a moral Utopia. That’s a hard pill to swallow for a futurist. One can only hope that the complex cycles of time always come around to this same place again. If Science, Technology, and Reason are transient, humanity can always look forward to their return. This entry was posted on August 21, 2013 by Scharlach. It was filed under Uncategorized and was tagged with History, Science Fiction, Technology. I’m with you on this. My outline of the druidic philosophy isn’t an endorsement, but merely an attempt to do Greer’s framework justice. (‘Justice’ in the purely techno-pragmatic sense, of course). Brilliant. Thanks for the reference. I haven’t read Greer much, but I’m glad you’ve introduce him to the group. I was skeptical about the existence of moral progress. As a neoreactionary, I outright deny it. Huh!??!!!!!!!! Civilizational progress has been nothing but moral progress, just not the moral progress that the Cathedral happens to be looking for.